Parents Christian Musaeus b. 3/4/1782 d. 12/20/1862 & Karen Bergitha Dahl b. about 1784 d. about 1865. H. Boseon Musnes Born 1802 age 78 Farmer, Eneberg age 71. Birth May 13, 1812 See Christening Record. Marriage Record for Hans and Ingeborg, https://familysearch.org/pal:/MM9.1.1/NWDM-FCQ Langestrand, Larvik, Vestfold, Norway, 21 August 1842, Hans Boesen Musius is age 31 and Ingeborg Cathrine Strom is age 33. Source Information: Batch M423781, 1779-1866, Film 0127585. Christening Record for Christian Frederik Hansen, https://familysearch.org/pal:/MM9.1.1/N4JK-SBD Langestrand, Larvik, Vestfold, Norway, 25 July 1841, Hans Boesen Museus Ingeborg Cathrine Andersdr. 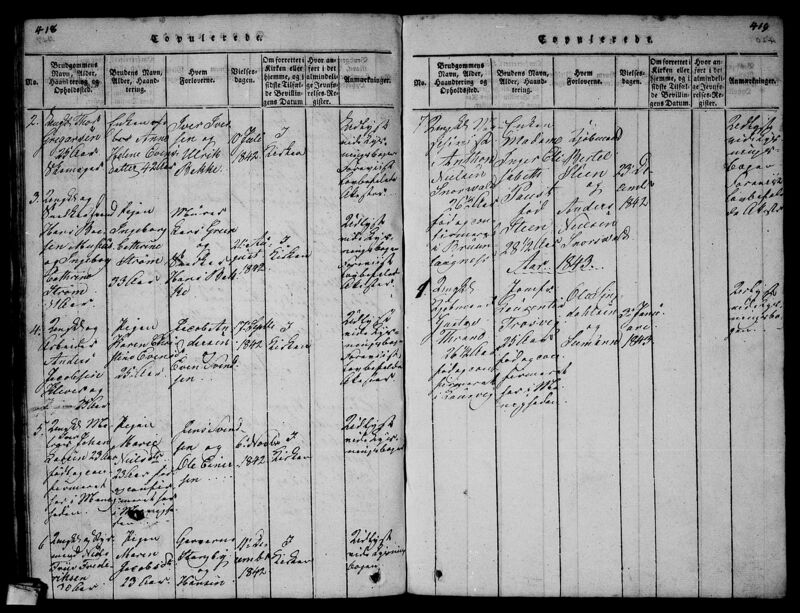 Christening Record for Halvor Ferdinant Hansen, https://familysearch.org/pal:/MM9.1.1/NWG6-QZQ Larvik, Vestfold, Norway, 31 December, 1843, Hans Bosen Museus Ingebor Cathrine Strom. Birth Record for Carl Fredrik Hansen, https://familysearch.org/pal:/MM9.1.1/NH54-DLQ Norderov, Buskerud, Norway, 25 March, 1846 Christening 28 February, 1847, Norderov, Buskerud, Norway. Birth Record for Nels Christian Hansen, https://familysearch.org/pal:/MM9.1.1/NHH1-6YY Honefoss, Norderov, Buskerud, Norway 06 June, 1849, Christening 18 November, 1849, Honefoss, Norderov, Buskerud, Norway. Immigration, 1851, Ixonia, Jefferson County, Wisconsin. See Barron County History. 1860 Census, FHL, Ixonia #763, Jefferson County, WI, H. Messuous 42, Carpenter, Value of Personal Estate 75, Place of Birth Norway, Catherine 40, Halver 16, Fredrick 14, Nels 11, all born in Norway. (No real estate value). (#761 is J. Halverson, 54, Farmer, Value of Real Estate 800, Value of Personal ?100, Norway, Hance, 18, Norway). Norwegians in Wisconsin according to the 1860 Census. http:///www.digitalarkivet.no Records 18349-18353. Name I. Messnaous 42, male, Norway, Ixonia, Jefferson, Page in the original #255. Catherine 40, Halver 16, Fredrick 14, Nels 11. Military Record, Civil War, Vesterheim Museum, www.vesterheim.org/CivilWar/db/m/mus/index.html, Museus, Hans B., WI 15th Inf Co D. (Waupun Co.) Residence: Oconomowoc, Waukesha County, Wisconsin. From Kristiania, Norway. Civil War: Age 45, Married. Blue eyes, gray hair, light complexion, 5'7". Enlisted for three years on 8 Jan 1862 at Oconomowoc, and mustered at Madison, Wisconsin, 18 Jan 1862. Private. Discharged from service for disability, 7 Aug 1862, at Jacinto, Mississippi. Enlisted again for one year on 1 Sep 1864 at Madison, Wisconsin. Enlistment credited to Windsor, Dane County, Wisconsin. Mustered 9 Sep 1864 at Madison. Bounty $100. Private. Discharged at Clarksville, Texas, on 19 Jul 1865. Post war: Died at Barron County, Wisconsin. Hans was father of Carl & Halvor. Sources: (SHSW Series 1200 boxes 76-6, 78-3, 132-13; red book vol 20, p62; vol 33) (ULVESTAD p311) (BUSLETT p452) (AGER p302) (HEDBERG) "Musdus, Hans". Musans, Carl F. and Museus, Halvor also listed. Other listings in Vesterheim website: Strem, Hans A.; Strom, Hans; Strom, Jens; Strom, Jens. Military Record, Enlistment, American Civil War Soldiers, http://search.ancestry.com/cgi-bin/sse.dll?rank=1≠w=1&tid=36530896&tpid=18949514449&ssrc=pt_t36530896_p18949514449&MSAV=0&msT=1&gss=angs-c&gsfn=Hans+Bohsen+Christiansen&gsln=Museus&msbdy=1812&msbpn__ftp=Trondheim%2c+Sor+Trondelag%2c+Norway&msddy=1886&msdpn__ftp=Turtle+Lake%2c+Barron%2c+Wisconsin%2c+USA&msrpn__ftp=Oconomowoc%2c+Wisconsin%2c+USA&uidh=3g6&msbdd=13&msbdm=5&msddd=3&msddm=3&pcat=39&h=3760441&db=civilwar_histdatasys&indiv=1 List of soldiers on page 40, Hans and Halvor Museus and Jens Strom enlisted January 8, 1862, with Company D, 15th Infantry Regiment, WI. Halvor mustered out February 13, 1865, Hans received a disability discharge on August 7, 1862, and Jens Strom received a disability discharge (page 42) on October 23, 1862. Military Record, Company Muster Roll, M 15 Wis. Hans Musuns Private, Co. D, 15 Reg't Wisconsin Infantry, Appears on Company Muster Roll for Mch & Apl, 1862 Present Kirby - Copyist. Military Record, Enlistment, September 9, 1862 Wisconsin 28th Company A Private Hans B. Musans, Madison, WI, Born Norway, Age 44, Occupation mechanic. Military Record, Enlistment, October 11, 1864, Enlisted September 1, 1864 for period of one year. Blue eyes, gray hair, light complexion, height 5 feet 7 inches. Bounty paid $33.00, Due $100. Military Record, Muster Out roll, August 23, 1865, Brownsville, Texas. Joined as recruit. Military Record, Discharged at Clarksville, Texas July 19, 1865. 44469 WD Trine Museus & H.B. Museus John Fried Zimmerman 1800 Sept 6, 78 Oct 3, 78 74 (vol. 74 p.453). Land Records, Deeds, Volume 46, page 129, Catharina Musaus, Witness, Nels; Volume 74 page 453 Trini Musaus & H.B. Musaus - Sold. Witnesses: Niels Museus and Notary in Waukesha. 1870 Census, U.S., Ixonia, Jefferson County, WI, enumerated June 16th, 1870 Post Office: Oconomowoc, WI, Page 34, #20, Dwelling 255, Family 261, Musseus, Hans 58, Farmer, Male Citizen, Ingeborg 61, Keeping House. Their birthplace and parent's birthplace was Norway. Value of real estate $1500.00, Value of Personal Estate $375. Church Record, Communicants, FHL, 1871, Page 88, Rock River, Musaus, Kone Nils Musaus. Land Records, Mortgages. Jefferson County. May 4, 1874, Volume 45 Page 252-253. Witness Jens Strom. Oconomowoc. Jefferson County Land Office Land Description and Directions. H. Mussus, Ixonia, 40 acres SE NE ¼ Sec 14 T8N R16E outskirts North to Mid Eastern. Take 94 to F, turn north (right) to Allen Road to Skislide Road North, take left on Branch Road to Genz Road, two houses before land on the south side of the road before you go on curve. Hans' land is to the south, across from two houses. Barn sits on property now. Now owned by Denis Rupnow and his wife. They live across the street in big two-story cream brick house with outbuildings. Land Records, Deeds, Jefferson County. Volume 46, Page 129. Trini Musaus, H.B. Musaus. Witnesses Niels Museus and Joel Carpenter. 1875 Census, Ixonia, Jefferson County, Wisconsin. 1st day of June. H.B. Musses, 2 males, 1 female. Land Records, Deeds. Volume 74, Page 453. Sale. Trini Musaus and H.B. Musaus. Witness Niels Museus. Land Purchase in Rush River, WI. 29 October 1879 Hans buys land in Rush River not far from Halvor's widow. Land description: Southside NE of SW1/4 26-28-17. 1880 Census, Rush River, St. Croix County, WI. http://www.familysearch.org/ H. Boseon Musnes, age 78, birthplace Norway, farmer. Eneberg Musnes, age 71, birthplace Norway, Keeping House. Parent's birthplace of both was Norway. Family History Library Film 1255445, Page 225D. Will (handwritten, photocopy) of Hans Bohsen Museus. May 22, 1882. I Hans Bohsen Museus, of the Town of Rush River, in the County of St. Croix and State of Wisconsin, being of sound mind and memory and understanding, do make my last will and testament, in manner and form as follows. First, I give, devise and bequeath to my wife, Ingeborg Katherine, all my property, real, personal and mixed of what nature and kind soever, and wheresoever the same shall be at the time of my death; the same to be in lieu of her dower at common law. Second, I give, devise and bequeath unto such of my younger son, Nels Christian Museus daughter, Olianne Kathrine Museus, of living at or after the death of my said wife, Ingeborg Kathrine, all the personal property of whatsoever nature and kind and wheresoever the same shall be at the time of my wife Ingeborg Katherine's death. In witness whereof, I, Hans Bohsen Museus, the Testator, have, to this last will and Testament, set my hand and seal this Twenty Second day of May A.D. 1882. Sale of Land in Rush River, WI. 23 May 1883. Sold to A.H. Thoen. Burial, March 9, 1886. Independent Cemetery, Arland, Wisconsin. Church Burial and Death Record for Hans. ALC, Roll 188. In Ministerialbog for Concordia, Norske Evang.-Luth. Menighed. Begyndt, 21st January 1883, Concordia Lutheran, Synod 1883. (Now a part of First Lutheran of Arland.) Ministerial records 1884-1934. First Lutheran of Arland, (Union in 1935 of Concordia - Synod 1883 - and Concordia-United Church 1890.) 7 mi. N.W. of Prairie Farm, Wis. Barron County. Anno 1884-95 Fordiceftede. #2, 9 March, 1886, Age 74, Hans Bosen Museus, 3 March, 1886. (#3 is 20 January, 1887, Age 37, Nils C. Museus, 14 January, 1887. Death of Nels. 14 January, 1887. 1890 Census, Veterans Schedule, Barron County, P. 2 ED 19, Turtle Lake, WI, Museus, Hans B. (deceased) Inga K. (widow) www.ancestry.com . Petition for Probate of Will, Barron County, 2nd June 1891, In the matter of the will of H.B. Museus Deceased. his son of full age and under no disability and that no person is named executor in said will. That your petitioner is widow of said deceased. Wherefore your petitioner prays that said will may be proved and allowed as the last will and testament, of said H.B. Museus deceased, and letters of administration with the will annexed thereupon granted to Ingeborg Katherine Museus. Clarence C. Coe, Attorney for Petitioner. Order for Hearing Proof of Will. Barron County, 2nd June, 1891. In the matter of the will of H.B. Museus Deceased. On reading and filing an instrument in writing, purporting to be the will of H.B. Museus late of Turtle Lake in said County, deceased; and also the accompanying petition of Ingeborg Katherine Museus of Turtle Lake representing among other things, that the said H.B. Museus lately died at Turtle Lake in said County that said instrument is the last will of said deceased, and that the petitioner is widow of deceased and praying that the said instrument may be proved and allowed as the last will and testament of said H.B. Museus deceased; and letters of administration with the will annexed be thereon issued to Ingeborg Katherine Museus. It is ordered, that said petition and the proofs of said instrument be heard at a regular term of said County Court, to be held in and for said County, at the Courthouse in the City of Barron on the First Tuesday being the 1st day of September A.D. 1891, where all concerned may appear and contest the probate thereof. Probate Notice. Barron County, June 2, 1891. In Probate. The application of Ingeborg Katherine Museus at admit to probate the last will and testament of H.B. Museus late of the Town of Turtle Lake in said County, deceased, and for letters of administration with the will annexed thereon to be issued to Ingeborg Katherine Museus of Turtle Lake, Barron County, Wisconsin. Dated June 2, 1891 By order of the Court, H.S. Comstock County Judge. Death of Ingeborg. 27 September 1897. See Barron County History. Petition for Probate of Will, Barron County September 29, 1902. In the matter of the will of H.B. Museus Deceased. In Probate. That said deceased left surviving Ingeborg Katherine Museus his widow Fred Museus, his son Nels Christian Museus, his son and Hans Museus, Fredrick Museus, and John Museus, heirs of Holver Museus, deceased. Of full age and under no disability and That no person is named as executor in said will. That your petitioner is a Grandson of said deceased. Wherefore your petitioner prays that said will may be proved and allowed as the last will and testament of said H.B. Museus deceased, and letters of administration with the will annexed thereupon granted to Alfred Museus. (His signature). Alfred Museus being duly sworn on oath says that he is the petitioner above named: That he has heard read the above and foregoing petition, and knows the contents thereof, and that the same is true to his own knowledge, excepting as to the matters therein stated on information and belief, and as to those matters he believes it to be true. Subscribed and sworn to before me this 29th day of September 1902. Alfred Museus. (His signature). Order for Hearing Proof of Will, Barron County, October 2, 1902. In the matter of the will of H.B. Museus Deceased. In Probate. On reading and filing an instrument in writing, purporting to be the will of H.B. Museus late of Turtle Lake in said County, deceased; and also the accompanying petition of Alfred Museus of said County representing among other things, that the said H.B. Museus lately died at Turtle Lake in said Court that said instrument is the last will of said deceased, and that the petitioner is a grandson of said deceased and praying that the said instrument may be proved and allowed as the last will and testament of said H.B. Museus deceased; and that letters of administration with the will annexed be thereon issued to said Alfred Museus. It is ordered that said petition and the proofs of said instrument be heard at a regular term of said County Court, to be held in and for said County, at the Courthouse in the City of Barron on the 1st Tuesday (being the 4th day) of November 1902, where all concerned may appear and contest the probate thereof. It is further ordered, that notice of the time and place of such hearing be given by personal service of a notice thereof on all persons interested, at least ten days before the time appointed, as aforesaid - by publication of such notice at least three weeks successively, previous to said time, in the Weekly Call a weekly newspaper, published at the City of Barron in said County. Dated October 9 1902. By the Court, C.W. Meadows, County Judge. Proof of Will not Contested, Barron County, Wisconsin, November 5th, 1902. At a regular Term of the County Court within and for said County of Barron begun and held at the Court House in the City of Barron on the 1st Tuesday of November 1902 Present C.W. Meadows County Judge. In the matter of the will of H.B. Mus Deceased. The instrument now shown to me, purporting to be his will, was signed by him at the Town of Rush River, St. Croix County, Wis on the 22nd day of May 1882. He at the same time declared said instrument to be his will, in my presence; Myself and Christian Hanson were present at the same time, and we severally subscribed our names to the same instrument, as witnesses, in the presence of said H.B. Museus. The said H.B. Museus was, at the time of signing said instrument, above twenty-one years of age and was of sound mind, as I verily believe. Certificate of Proof of Will for Hans B. Museus. Dec., 1902. State of Wisconsin, Barron County. Be it remembered, that on 5th of November A.D. 1902, at Barron in said County, pursuant to notice duly given, as required by law, at a regular term of the County Court of said County, H.G. Thoen, one of the subscribing witnesses to the Last Will and Testament of Hans B. Museus late of Turtle Lake, in said County, deceased, hereto annexed, being produced and duly sworn and examined in open court. And the proofs having been heard before said Court, and the Court having thereupon found that said instrument was in all things duly executed as his last will and testament by the said Hans B. Museus. Thereupon said instrument was by the order and decree of said Court duly allowed and admitted to probate, as and for the last will and testament of the said Hans B. Museus, deceased. In Testimony Whereof, I have hereunto set my hand and affixed the seal of the County Court of said County at Barron this 2nd day of Dec A.D. 1902. C.W. Meadows, County Judge. Proof of Will Barron County. December 2nd, 1902. At a regular term of the County Court within and for said County of Barron, begun and held at the Court House, in the city of Barron, on the 1st Tuesday of December 1902. Present C.W. Meadows, County Judge. In the matter of the will of Hans B. Museus deceased. The matter of hearing the proofs of the instrument propounded by Alfred Museus as the last will and testament of Hans B. Museus deceased, having come on to be heard at the Term of said Court, and it appearing that due notice of the time and place of such hearing has been duly given as required by order of the Court herein made on the 9th day of October 1902. That said Hans B. Museus died at Turtle Lake in said county on the 3rd day of March 1885. That at the time hereinafter mentioned the said Hans B. Museus was of full age and of sound mind. That said instrument was at the same time duly attested and subscribed by H.G. Thoen and Christian Hansen. Who were competent witnesses thereto, in the presence of said Hans B. Museus who at the same time declared it to be his will. That said instrument is the last will and testament of said Hans B. Museus deceased and in all things duly executed. Wherefore it is ordered and decreed, that said instrument be allowed and probate thereof granted, as the last will and testament of said Hans B. Museus deceased. Letter written by Frank Baker. December 2, 1902. In the matter of the will of H.B. Museus, deceased. Frank Baker being produced and sworn in open court, says in relation to said matter; I live in the town of Prairie Farm, Wis., I knew H.B. Museus during his lifetime. He died at the town of Turtle Lake, Wisconsin about the month of March, 1885. I do not know the exact date of his death, but I saw him there dead at that time. Veterans Grave Registration, Civil War. Independent Cemetery Lot 6 Block 4. Veterans next-of-kin Charles Museus (son). Information provided by Mrs. Henry Ness, Mrs. Baker. GAR Marker. History of Barron County. Page 966. Charles F. Museus, veteran of the Civil War, retired business man of Chetek, was born in Christiania, Norway, March 25, 1847, son of H.B. and Katherina (Strum) Museus, who brought their family to the United States in 1851, came into Wisconsin by way of Milwaukee, and settled about four miles from Oconomowoc, Jefferson County, Wis., where the father had a farm and also worked at his trade as a carpenter. In 1880 they came to Barron County, and settled on a farm of 40 acres in Turtle Lake Township, a son, Nels C., securing a similar tract adjoining. The father erected a pleasant home but did not cultivate the land, devoting his time to carpenter work in the neighborhood. The mother died at the age of seventy-five. Later the father took up his home with his granddaughter, Mrs. Christ Wold, near Haywood, Wis., where he died at the age of eighty-eight. Of the nine children in the family six died young, one being drowned. Halvor F. and Nels grew to adult years, but both are now deceased. Charles F. had but little chance for an education, and started out for himself at an early age. Three members of the family enlisted in the Civil War. The father and Halvor F. fought at Island No. 10 on the Mississippi. Charles F. was in the 28th Wisconsin Volunteer Infantry. He served along the Tombigbee River, as well as at the attack on Fort Blakely and the Spanish Forts. Later he was sent under Sheridan to the Mexican border to protect Texas from becoming involved in the troubles incident to the overthrow of Emperor Maximillian I, and the withdrawal of the French. Death of Carl. 8 July, 1924. See Obituary. Charles F. Museus was born in Oslo, at that time Christiania, Norway, in 1847. His parents brought their family to the United States in 1851, came to Wisconsin, and settled near Oconomowoc in Jefferson County. There his father engaged in the carpenter trade as well as in farming. In 1880 they came to Barron County, locating in Turtle Lake Township, and later moving to Chetek. Mr. Museus (Carl) had little opportunity for an education and started out early for himself. With the opening of the Civil War he enlisted in the 28th Wisconsin Volunteer Infantry and served along the Tombigbee River, as well as at the attack on Fort Blakely and the Spanish Forts. Later he was sent under Sheridan to protect the Texas border in the tronbles incident to the overthrow of Emperor Maximillian I and the evacuation of the French from Mexico?. Mr. Museus was the last of three brothers. WI 15th Inf Co D. Residence: Oconomowoc, Waukesha County, Wisconsin. From Kristiania, Norway. Civil War: Age 45. Married. Blue eyes, gray hair, light complexion, 5?7?. Enlisted for three years on 8 Jan 1862 at Oconomowoc, and mustered at Madison, Wisconsin, 18 Jan 1862. Private. Discharged from the service for disability, 7 Aug 1862, at Jacinto, Mississippi. Enlisted again for one year on 1 Sep 1864 at Madison, Wisconsin. Enlistment credited to Windsor, Dane County, Wisconsin. Mustered 9 Sep 1864 at Madison. Bounty $100. Private. Discharged at Clarksville, Texas, on 19 Jul 1865. Post war: Died at Barron County, Wisconsin. Hans was father of Carl & Halvor. Sources: (WHS Series 1200 boxes 76-6, 78-3, 132-13; red book vol 20, p62; vol 33) (Ulvestad p311) (Buslett p452) (Ager p302) (Hedberg) ?Musdus, Hans? [S52] Church Christening Records for Hans Bohson Musaeus, Film 0126822., LDS Film 0126822 Book 6 Dobte #77 (Reliability: 3). [S32] Birth Record, Film 0126822 Domkirken in Trondheim Church Item 77 Book 6 Dobte 4 Jun 1812 (Reliability: 3), 21 Jun 2012. Sør-Trøndelag county, Domkirken in Trondheim, Parish register (official) nr. 601A07 (1770-1819), Birth and baptism records 1812, page 210. [S100] LDS Birth Record, https://familysearch.org/pal:/MM9.1.1/NWDR-ML6 (Reliability: 3), 21 Jun 2012. [S32] Birth Record, Film 126822 No. 77. June 1812 (Reliability: 3), 21 Jun 2012. 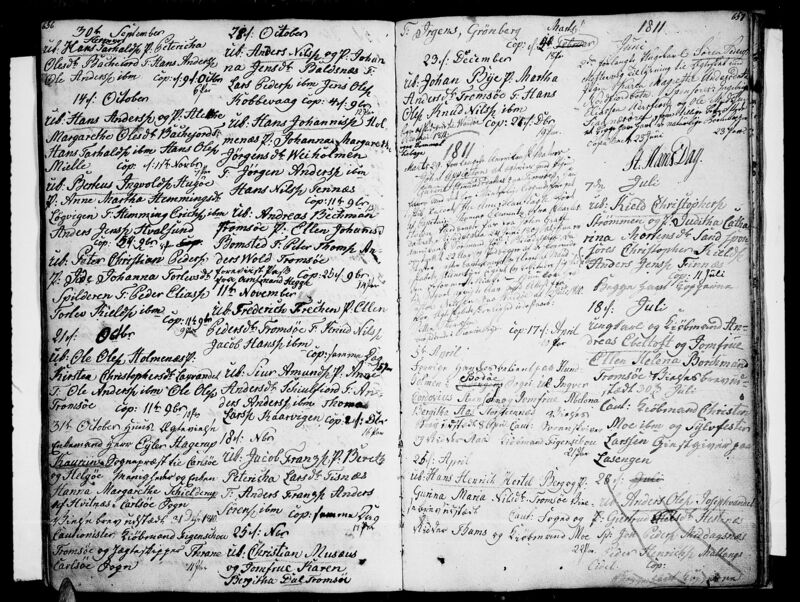 "Norway, Baptisms, 1634-1927," index, FamilySearch (https://familysearch.org/pal:/MM9.1.1/NWDR-MLX : accessed 08 Sep 2012), Christian Musaeus in entry for Hans Botzien Christiansen, 13 May 1812; citing reference 1770-1819 b.6, FHL microfilm 126822. 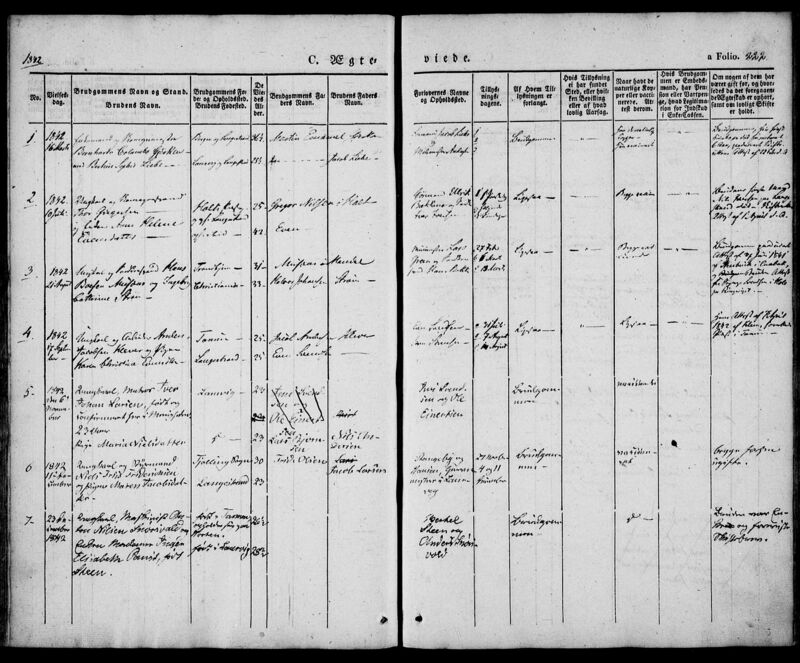 [S101] LDS Christening Record (Larvik, Langestrand, Vestfold, Norway), Norway Baptisms 1634-1927, https://familysearch.org/search/recordDetails/show., https://familysearch.org/search/recordDetails/show?uri=https://api.familysearch.org/records/pal:/MM9.1.r/MJQN-6T8/p1 (Reliability: 4). [S103] LDS Marriage, Familysearch.org, https://familysearch.org/pal:/MM9.1.1/NWDM-FCQ (Reliability: 3), 21 Jun 2012. [S100] LDS Birth Record, https://familysearch.org/pal:/MM9.1.1/NH54-DLQ (Reliability: 3). [S3] 1860 Census U.S. Census; Online Images, Ixonia Jefferson WI July 18th 1860 No. 763 (Reliability: 4). [S6] 1870 Census U.S. Census, Wisconsin, Ixonia; Online Images, 1870 Census, U.S., Ixonia, Jefferson County, WI, enumerated June 16th, 1870 Post Office: Oconomowoc, WI, Page 34, #20, Dwelling 255, Family 261, (Reliability: 4). Musseus, Hans 58, Farmer, Male Citizen, Ingeborg 61, Keeping House. Their birthplace and parent's birthplace was Norway. Value of real estate $1500.00, Value of Personal Estate $375. [S6] 1870 Census U.S. Census, Wisconsin, Ixonia; Online Images, http://search.ancestry.com/iexec?htx=View&r=an&dbid=7163&iid=4268464_00234&fn=Haudr&ln=Musseus&st=r&ssrc=πd=8260147 (Reliability: 4). [S9] 1880 Census U.S. Census; Online Images, http://search.ancestry.com/cgi-bin/sse.dll?indiv=1&db=1880usfedcen&rank=1≠w=1&MSAV=0&msT=1&gss=angs-d&gsfn=hans&gsln=musnes&msrpn__ftp=Wisconsin%2c+USA&msrpn=52&msrpn_PInfo=5-|1652393|2|3247|52|&dbOnly=_83004045|_83004045_x%2c_83004006|_83004006_x%2c_F000279A|_F000279A_x&uidh=3g6&_83004003-n_xcl=f&pcat=CEN_1880&fh=0&h=29071158&recoff=&qid=e0ffd9cbb0c14e6f9b502d16830c38d4 (Reliability: 4). Nos. 723953 and 72954 (Reliability: 4). [S12] 1885 Census - Wisconsin (Reliability: 4). [S177] Ministerialbog for Concordia Norske Evang.-Luth. Menighed, Church Burial and Death Record for Hans. ALC, Roll 188. In Ministerialbog for Concordia, Norske Evang.-Luth. Menighed. Begyndt, 21st January 1883, Concordia Lutheran, Synod 1883. (Now a part of First Lutheran of Arland.) Ministerial records 1884-1934. First Lutheran of Arland, (Union in 1935 of Concordia - Synod 1883 - and Concordia-United Church 1890.) 7 mi. N.W. of Prairie Farm, Wis. Barron County. Anno 1884-95 Fordiceftede. #2 (Reliability: 4). #2, 9 March, 1886, Age 74, Hans Bosen Museus, 3 March, 1886. (#3 is 20 January, 1887, Age 37, Nils C. Museus, 14 January, 1887. [S184] Independent Cemetery of Arland (Arland, Barron, Wisconsin, USA), Original, handwritten plat book, Museus. Mrs. Gunderson. Block 4, Lot 6. Edwin Grant Gunderson, Mathilda Gunderson, Oleana Gilbertson Buried July 2, 1951, Ida Amborn 1967, Muses, Nels Muses, Agnes Severson 1972, Henry Severson 1966. (Reliability: 4). A military tombstone for Hans Museus was added at a later date. I do not know where Ingeborg is buried. There is no marker for her here. 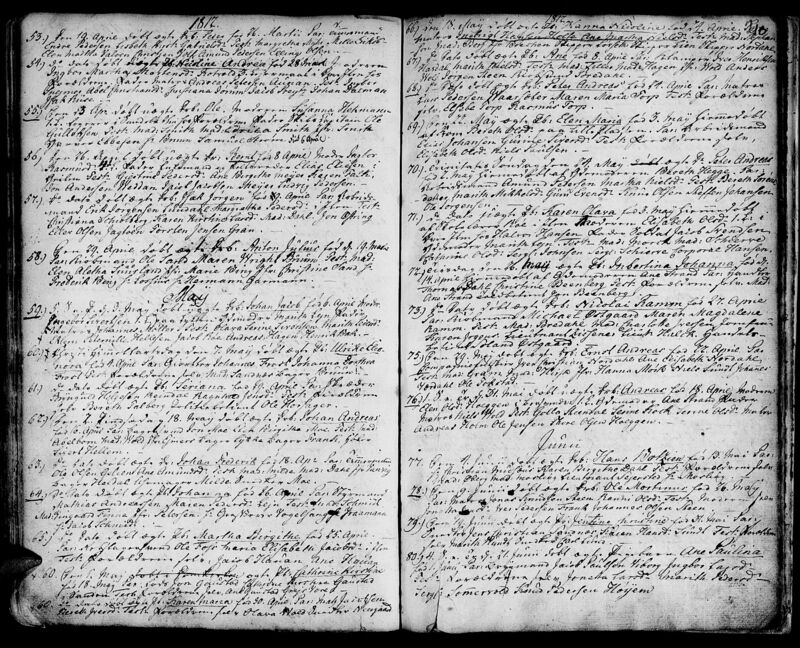 [S174] Burial Record, Family Search, (Name: FamilySearch.org;) (Reliability: 3). [S103] LDS Marriage, Familysearch.org (Reliability: 3). [S181] "Digitalarkivet", The National Archives of Norway , Arkivverket Digitalarkivert, Troms county, Tromsø, Parish register (official) nr. 6 (1806-1821), Marriage records 1811, page 656-657. (Reliability: 3), 16 Dec 2015. [S103] LDS Marriage, Familysearch.org, https://familysearch.org/pal:/MM9.1.1/NWDM-FCQ Source Information: Batch M423781, 1779-1866, Film 0127585. (Reliability: 3). Marriage Record for Hans and Ingeborg, Langestrand, Larvik, Vestfold, Norway, 21 August 1842, Hans Boesen Musius is age 31 and Ingeborg Cathrine Strom is age 33.